CEO Bruce Anderson is interviewed by WDVM following his retirement announcement, check out the video! BOONSBORO — An older man hears a knock at the front door of his home in Franklin County, Pa. Standing on the other side of the door is someone he had never seen before — a short man with brown hair, a wide smile and kind eyes. Unsure of the visitor’s intentions, the man responds with skepticism. “What do you want?” the man asks in a gruff voice. 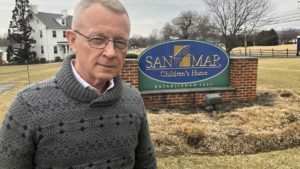 Bruce T. Anderson made the trip to the mysterious man’s home one day in the late 1980s, after learning that he might be planning to give $200,000 in his will to San Mar Children’s Home. He told the man he wanted to confirm the rumor. At first, the man denied he even had a will. And if he did, what did Anderson, the then-recently hired CEO of San Mar, want to talk about? The man finally opened up, saying the money was part of a trust fund. He invited Anderson into his home. About five years later, the man died with about $600,000 set aside for San Mar, resulting in more than $1 million in accrued interest revenue paid to the organization over the years, Anderson said. The encounter ultimately led to substantial financial support, but Anderson, who is planning to retire next month after three-plus decades, said his work, and life in general, has never been about money. He said he simply tried to appeal to a person’s natural desire to give. Looking back on the past 33 years, Anderson, 66, described himself as “outrageously blessed” to have worked with a great group of staff members and volunteers. His final day will be March 31, capping off a long career as San Mar’s 10th director, starting in 1985. “When people talk about San Mar, they talk about Bruce,” said Keith Fanjoy, director of San Mar’s Bester Community of Hope project, who will succeed Anderson. Fanjoy pointed to the thousands of children who Anderson has assisted and gotten to know personally over the years. After Anderson’s arrival, San Mar expanded its programming to include treatment foster care, outpatient mental health services, prevention services through the Bester Community of Hope initiative, and six residential programs in Boonsboro and Cumberland that focused on the needs of adolescent girls. Nearly 2,500 children have stayed in San Mar’s residential and foster-care programs during Anderson’s tenure, at a time when many programs were scrutinized. Anderson said the Sun article was particularly memorable, especially because he was unsure the tone the story would have. In 2008, he raffled off a house, netting $250,000 and garnering international attention. An avid bicyclist, he started an annual ride down the Chesapeake and Ohio Canal that’s now entering its 30th year and generates more than $100,000 annually. As a result of a shift in community needs and clinical approaches, residential-care facilities have undergone changes in recent years, and San Mar has done so, as well. In July 2016, San Mar finished phasing out its group homes for adolescent girls, opting to focus more on supporting children and families earlier in hopes of preventing the need for group care later in life. A similar change happened in the 1980s, when orphanages essentially disappeared. Service providers moved toward a model focusing on clinical and behavioral health services, according to Anderson. San Mar’s focus now resides in three core programs — foster care for girls and boys, a new outpatient mental-health clinic and Bester Community of Hope, which Fanjoy has headed for a few years. With Fanjoy’s experience with that program, and others through his 12 years at San Mar, it created a logical point for Anderson to call it a career. When Anderson said he believes all people have a need to give, it even includes those who receive. For example, Anderson recalled a program at Christmas in which community members were invited to buy gifts for the girls. One year, a girl received a gift from a woman, but instead of reacting positively to receiving what the giftgiver thought she wanted, the girl pouted and appeared angry after unwrapping the present. It provided a teachable moment for the rest of the group. The girls reacted differently the following year. The girl who pouted the year before received a jewelry box with a broken door. She opened the gift, found the defect and rather than act upset, she smiled and simply acknowledged that it could be fixed or replaced with a new one. Unfortunately, though, the skirt was entirely too big. But how did the girl react?